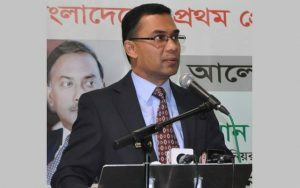 Detained BNP Senior Joint Secretary General Tarique Rahman has secured bail in all the 13 cases filed against him as the Supreme Court (SC) on August 19, 2008 granted his bail prayer in the Tk 21 crore bribery case. The three-member full bench of the Appellate Division headed by Chief Justice MM Ruhul Amin granted Tarique two months’ ad interim bail yesterday in connection with the case involving the murder of Bashundhara Group Director Humayun Kabir Sabbir. The same bench of the apex court also upheld the High Court (HC) stay order on the proceedings against Tarique in a tax evasion case filed by the National Board of Revenue (NBR). Tarique’s counsels said now there is no legal bar to Tarique’s getting released from jail. Meanwhile, the HC granted four months’ ad interim bail to detained former prime minister and BNP Chairperson Khaleda Zia in the Barapukuria coal mine corruption case filed by the Anti-Corruption Commission (ACC). The court also extended for three months its earlier orders that stayed the proceedings against Khaleda in the Gatco and Niko graft cases filed by the anti-graft body. On October 4 last year, ACC Deputy Assistant Director Abul Kashem filed the bribery case with Ramna Police Station against six persons including former state minister for home Lutfozzaman Babar. Tarique and former BNP lawmaker Qazi Saleemul Huq Kamal were later included in the case as investigation found their involvement in the bribery to save Shafiat Sobhan Sanvir, son of Bashundhara Group Chairman Ahmed Akbar Sobhan alias Shah Alam, from charges of killing Sabbir. Tarique filed a petition with the HC for quashing the proceedings against him and for his bail in this case. On August 7, the HC rejected the petition and permitted him to appeal with the SC against the order. Tarique filed the appeal with the SC recently. The Appellate Division yesterday heard the application and granted him bail on health grounds. Tarique’s lawyer barrister Mahbub Uddin Khokon yesterday told newsmen that the SC granted bail to Tarique after examining his medical report prepared by a medical board. “Tarique has secured bail in all the 13 cases filed against him and the High Court also stayed the proceedings against him in all these cases. So, there is no legal bar to his getting released from jail now,” he added. On August 4, NBR Deputy Tax Commissioner Samia Akhter filed a case with the Senior Special Judge’s Court in Dhaka against Tarique on charges of dodging Tk 26.86 lakh in income tax during 2002-2006. On August 12, following Tarique’s petition the HC stayed the proceedings of the case for three months. The government filed an appeal with the SC against the HC order but the Appellate Division yesterday dismissed the government appeal and upheld the HC stay order. An HC bench comprising Justice Sharif Uddin Chaklader and Justice Md Emdadul Haque Azad yesterday granted Khaleda ad interim bail for four months in the Barapukuria coal mine graft case. Responding to a petition filed by Khaleda, the HC bench also issued a rule upon the government, asking it to explain within six weeks why she should not be granted regular bail in the case. Another HC bench comprising Justice Khademul Islam Chowdhury and Justice Mashuque Hosain Ahmed extended for three months its earlier orders that stayed the proceedings against Khaleda in the Gatco and Niko graft cases. On August 26, the former prime minister secured ad interim bail from the HC in the Zia Orphanage Trust corruption case. 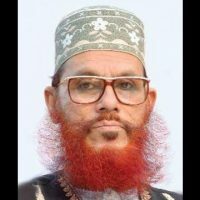 Meanwhile, upon a writ petition, the same HC bench issued a rule upon the government, asking it to explain within two weeks why the initiation and continuation of the Tk 3 crore extortion case filed by Azam J Chowdhury against former prime minister and Awami League chief Sheikh Hasina should not be declared illegal. The SC also dismissed another government appeal against the HC order that stayed the proceedings against BNP leader and former health minister Dr Khandaker Mosharraf Hossain in a tax evasion case filed by the NBR. 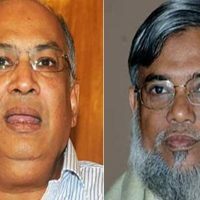 Upon a petition, the HC bench of Justice Sharif Uddin Chaklader and Justice Md Emdadul Haque Azad extended for six months its earlier orders that granted bail to BNP leader and former agriculture minister MK Anwar in the Gatco graft case.